After the festive break, Sonning returned with the seemingly unpleasant prospect of facing top of the league, and neighbours Reading 3s. Having been humbled 0-3 in the reverse fixture, they made the 400m walk to their away fixture on the Reading ‘water-based’ pitch which is usually so great to play on. Today however, there was a nice sheen of frost, and water jets that would remain firmly off for the duration. Despite this, by the time a 12pm pushback came around, the sun was blazing, and the air a balmy 4 degrees. Perfect. Sonning however were red hot out of the blocks, with a full strength squad and plentiful pitch time for their warm up, and they were three up inside 20 minutes. For the first goal, Ed Williamson popped up to slot in a short corner rebound for his first Sonning 1s goal. This was quickly followed up by a composed reverse finish by Noel Plant. Not long back from a long term injury, he was sharp enough to get to another rebound first and finish well. 0-2. This was indicative of the overall play in the first half an hour, as Sonning were quicker to their 50/50s, more aggressive and generally sharper. The proof of this lay in the number of turnovers Sonning created high up the pitch, and James Manser in particular led the line well in turnovers. He also got himself among the goals after converting one such turnover, beating his man and finishing with a slick strike, just inside the left post for 0-3. Reading found themselves a lifeline however, just a few minutes later. Keep Ben Sully had made several sharp saves to this point, but he was unable to keep out rebound shot after having made the save from the initial drag flick. For a short spell the game turned sour, Reading received a green card for a trip on James Lockhart before both sides received a 10 minute yellow to make it 9 vs. 10 for the closing minutes of the half. After the break Reading brought the game back to 2-3 fairly promptly, with another effort bundled in on the rebound from a short corner. However, Sonning rallied well, and once back up to 11, looked to press for a fourth. They came close through Ollie Waddington first. James Lockhart timed an interception well with Sonning penned into their own 23 and Sonning broke quickly down the right. Colm Hanlon tore a line down the middle of the pitch to put himself into a striking position, but his strike was saved well. The loose ball bounced back to the top of the circle but Waddington could only strike agonisingly wide. Sonning put the game out of reach shortly after however with a fourth through Manser, and a Hanlon deflection for 5-2. Manser’s goal was pure instinct, as a crash ball bounced up off a defender’s stick and he hit it on the volley without breaking stride. Hanlon’s was a team goal however, and a lesson on counter attacking hockey. A defensive short corner was restarted quickly by Matt Sloper to Ian Gallagher on the right wing. His turn of pace took him into space before he drilled in a pinpoint ball to the waiting Hanlon, whose deflection was sublime, and beat the keeper at his far post for 5-2. With the game out of sight, Sonning had a couple more chances, through Thomas Sampson and Jonty Rider which went begging, before Reading got their 3rd, and Noel Plant struck back for 5-2. Reading’s goal was a soft drag flick that Sully will have been disappointed to let in, while Plant finished coolly after good work and an initial strike from Ian Gallagher, finishing off the 3-6 scoreline and leaving the spectators purring. 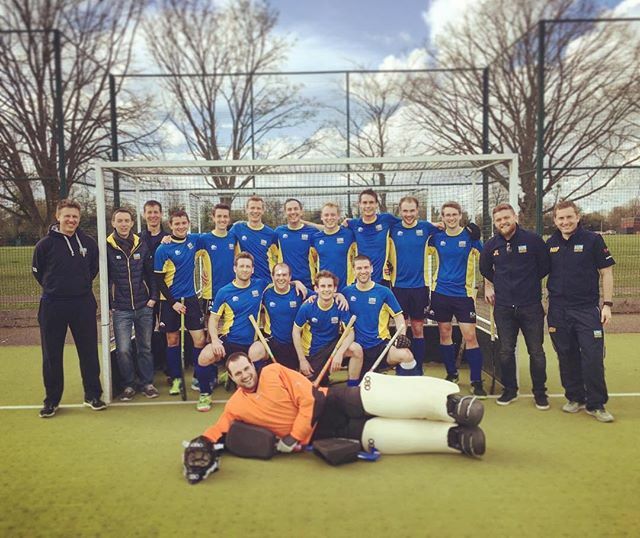 Next up, Sonning host Oxford 2s, and will be looking to put right their performance from before Christmas, where they squandered a baker’s dozen of chances to drop 2 points. COTN.